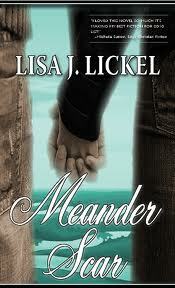 I happen to be friends with Lisa Lickel, the author of Meander Scar.I’ve read two of her other books and have reviewed them here on my blog (Summer in Oakville and The Map Quilt). When she gave me a copy of her book Meander Scar to read, I felt honored. Always dicey though to review a book by a friend because I want to be honest. But I dug in and read. Meander Scar has to be one of the best books I have read in a long time. I couldn’t put it down and when I got to the end I just wanted to cry. I still do as I think of it. Ann Ballard has been living her life in limbo since her husband Gene disappeared in New York seven years go. Attempts to rule him as dead were constantly blocked by Gene’s mother, Donna. Ann’s son has been angry and blaming his mother for his father’s disappearance but is now married about to have a child of his own. Oh, and there’s money. Huge amounts of money, held in trust and locked away from Ann so she barely can survive in spite of her missing husband’s wealth. Then Mark Roth rolls back into town, all grown up from the 19 year old next door neighbor boy – now a man and an attorney and declares his love for the 40 something Ann, it propels them on a journey of towards love and to uncover the truths behind the mystery that has held Ann captive for seven years. Can Mark prove his love to Ann ‘s heart that has been abandoned and alone for so long? Can they overcome the age differences? Can Mark find the family and love he has only ever seen from Ann but never experienced in his own family? Can love prevail and faith grow through the twists and turns that life takes? I don’t want to spoil the surprises in what is a mysterious love story that will twist your heart and raises the bar to what a biblical version of love really is. Lisa writes with raw passion with all the emotions expressed from love to anger to despair and to grief. She takes you there which is wonderful and uncomfortable all at once. I love Mark and Ann and wish there were a sequel to their love story. . . it might only have the mystery of how love prevails over time, but isn’t that the greatest mystery of all anyway? I love this book. If I didn’t have it in ebook form it would be one of the few books that would never leave my possession (I often give paperback fiction books away to our church library). Not because I want to be selfish – but more because it’s one of those rare books I would want to read again. . . and again. . . I need to create a category on my kindle for “keepers” – this would be one of the rare books in there. Kudos, Lisa Lickel, on a fabulous piece of fiction. And thank you for being a mentor and friend in my own writing journey. You are a jewel. Wellll….Rachel has been poking me pretty hard to tell her side….give me a few more hours in a day and we’ll get it out there.